The gold market was wild last month, what was it like at J. Austin & Company? 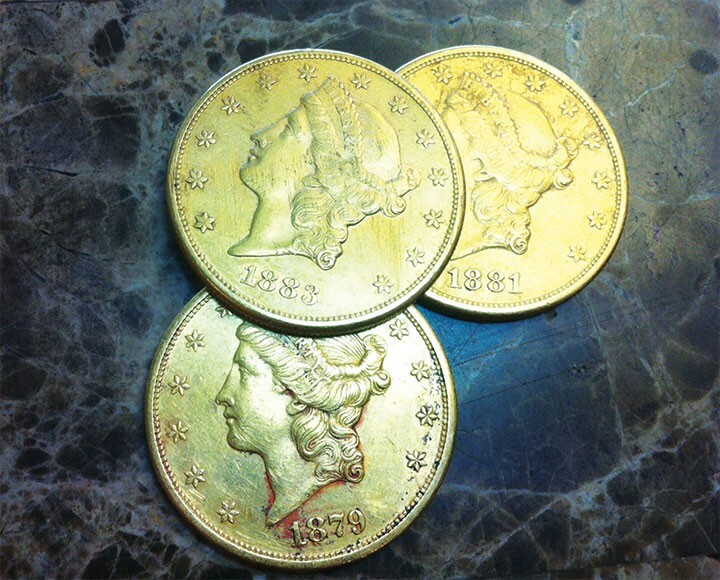 In addition to opening our new location in Grants Pass, we purchased several large historic gold coins from a local treasure hunter. These beautiful Lady Liberty coins from the late 1800s have had a wild ride. After years of investigation, searching and negotiating, our adventurer, in partnership with the landowner, excavated the site of a local legend and struck gold. Is it really buried treasure? Where was it found? The treasure is local, but our treasure hunter is not divulging any locations at this time. The gold was literally buried in the ground. Our local adventurer’s theory is that a highwayman or bandit gang had to hide a heavy bag of stolen coins in the unoccupied countryside while eluding the law and they never came back to recover it. They may have been captured or shot while attempting to rob another stage coach or train. At some point the land the bandits hid the gold on transferred to a local farmer. Since the 1950s over 110 gold coins have been found on this private property. The majority of these coins were found over 60 years ago, but some have made it to the surface recently and those coins are now for sale in our shop. Are these real gold coins? Yes, from 1795 when the United States of America was a fledgling nation to 1933 when the government recalled them, gold coins were one of the higher denomination currencies. The gold coins circulated by the United States were roughly 90% gold. U.S. gold coins can vary from as little as $1 in face value all the way up to $50 and can contain up to an ounce of gold. Aside from the gold value, the numismatic value of these beautiful works of art makes these coins treasured on many levels. We move the coins to the right collectors who will pay real prices for these shining jewels of American history. I have a dollar; do you have any one dollar gold coins for me? (Laughs) Nice try. You might have better luck with silver dollars. 1964 and earlier dimes, quarters and half dollars made of 90% silver are sometimes still in circulation for those willing to look. How do I find treasure? Do I need a metal detector? The best treasure hunters are historians who are both lucky and well informed, you don’t always need special tools. Back when we bought estates in Europe many of the finds were accidental. Like the local incident, many historic sites are often unearthed by unsuspecting farmers. Keen treasure seekers use logic and reason to determine where artifacts might be. Metal detectors come into play once a site has been determined. Many coins and pieces of jewelry are unearthed or found. Items belong to us only while we are here and using them, if we sell them, we get the value out of them, if not, they inevitably fall into the hands of future generations by one means or another. Why does your shop get all the interesting finds? Our customers know that they and their goods will be treated with respect. J. Austin & Company values the history of their pieces as much as they do. The brave souls who pan for hours hunched over a creek, or pace miles in the hot sun with a heavy detector know we pay the strongest for their treasure, and we always try to find homes for unusual items of value. J. Austin & Company is a coin, jewelry & diamond buyer located in Ashland Oregon. The company is currently run by the Grandson of J. Austin, Mark Hutto. Hours of operation are from 10:00am to 5:00pm Monday through Saturday.